Mac Minis are great for home studios, or when combined, great for macOS Servers. The Mac Mini Duo is the perfect solution for mounting Mac Minis into a server rack. The Mini Rack Duo allows up to two Mac Minis to be installed into any standard 19" 2 Post and 4 Post server racks. The cantilever shelf is easily mounted to racks using round holes, or square hole racks using cage nuts. 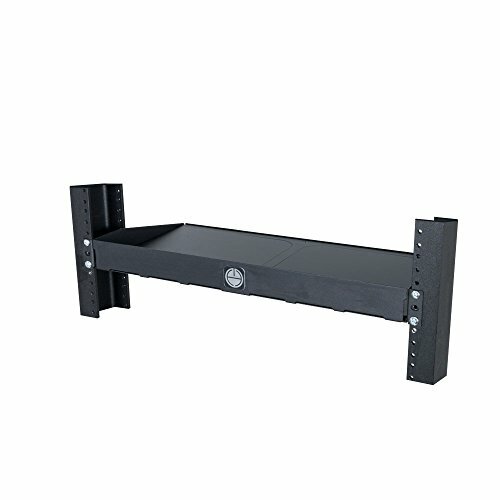 Like the original Mini Rack and Mini Rack Access, shallower version of this shelf is designed to allow airflow from the front and release from the back, separating cold and hot air. Each mac mini is separated and held in place with laser cut acrylic inserts. If you have any questions about this product by H-Squared, contact us by completing and submitting the form below. If you are looking for a specif part number, please include it with your message.